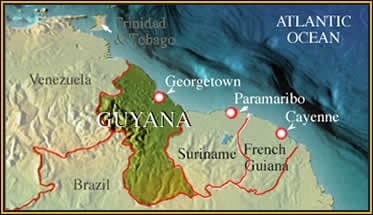 Location: Although a South American country, Guyana very much looks to the Caribbean. It’s borders are disputed with Venezuela and Suriname. Black caiman are endangered and almost extinct throughout almost their formerly huge Amazonian range, being hunted for skins by Brazilian poachers for years. However they are still present in large numbers in two locations, the Kaw Swamps in French Guiana (where they are now being hunted) and on the Rupununi River in Guyana. For the people of the Rupununi the fact that the large crocodilian living alongside them is a rare and endangered species is of little interest, they consider this large 20ft (6m) predator a dangerous menace when it kills valuable hunting dogs, children and even adults. Families are left to mourn lost loved ones with no bodies to bury, and some river people have to grow up, their lives and bodies scarred by encounters with black caiman. Mark fervently believes in the conservation of the remaining crocodilians but plainly the Rupununi black caiman are not the endangered species here, it is the besieged human population that is at most risk. How can he equate his concern for the future of the black caiman with the heart-rending stories he hears from the river folk ? Can man and caiman live alongside each other without fear or danger ? 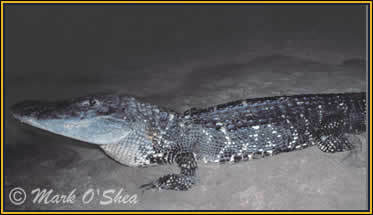 A close view of a 10ft (3m) Black caiman (Melanosuchus niger), note the raised vertebral ridge on the back.